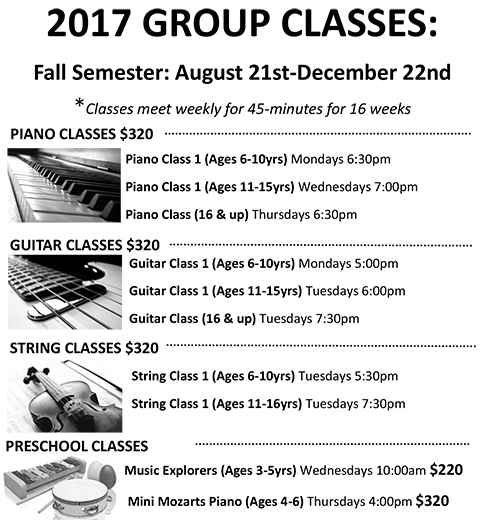 Fall Semester (Aug. 21 – Dec. 22) of 2017 is out now. Next Next post: 2017 Holiday Hoopla! My 7 year old son Jakob currently attends Music Therapy at Musical Surprise for an Autism diagnosis. I have to say music is the one thing that has helped Jakob calm down from his melt downs, even as an infant. There was a specific song that I would play for Jakob as a newborn even through his toddler years that would always calm him. To this day he remembers that song, when it plays he says Mom that was my special song in excitement. Jakob listens to music on a daily basis and truly enjoys attending weekly Music Therapy, he counts down the days till his next visit. I truly believe that Music Therapy has made a BIG difference in not only Jakob’s life but for our family as a whole. He is more verbal, he now makes eye contact for short periods of time with others which he has always had a hard time doing. I no longer always have that angry child who cannot express himself verbally. He has made great progress from working with Masato and I’m eager to see what’s to come. So you ask what music means to me? Music means a very deserving child finds and expresses happiness, even if it’s just for a few minutes a day. Music means from time to time I get to hear my child use his words to express himself instead of physically acting out. Music means I get a small thing many parents take for granted, eye contact with my child. And last but not least music means there’s hope! Hope for my special child who has so much to offer finds a way to shine in this world! I feel he will benefit immensely from continuing Music Therapy.